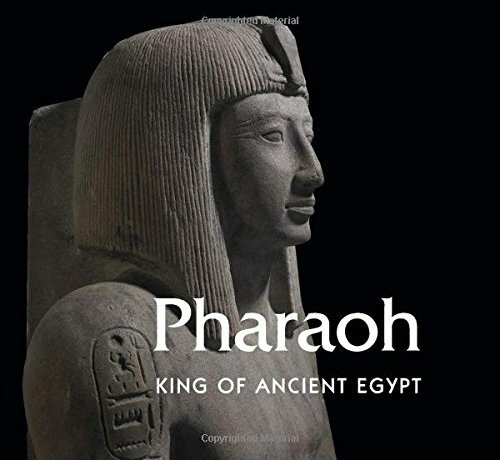 This sumptuous publication, produced for an exhibition in Cleveland in the summer of 2016 in collaboration with the British Museum, is a combination of exhibition catalogue and study of kingship in ancient Egypt. It begins with an introductory section outlining the history of the British Museum and the role and image of pharaohs throughout Egyptian history. The main part of the book is divided into sections related to the wide range of artefacts on display, a mixture from both museums, grouped thematically (including the symbols of power, temples and kingship, palace life, government and warfare, and death and the afterlife). The final section summarises each section of the exhibition with photographs to illuminate the narrative. An informative text explains the role of symbolism in Egyptian art, using illustrations from the exhibits. The statues of Senusret II with their apparent realism, for example, are not intended as portraits but rather symbolise the role of the pharaoh and his responsibilities. A stela depicting Rameses II as a child sitting on a throne shaped like the akhet or horizon sign does not represent the living king but his symbolic role as a manifestation of the sun god, reborn every morning, emphasising the divine connections of the king. An ostracon showing Rameses II being suckled by a goddess serves the same purpose. Many of the high-quality photographs are of representations of pharaohs throughout history, ranging from sculptures to ostraca. Others are of uncommon or unique items such as a colour palette used by an official, and a flask in the shape of a scribe which may have had magical properties or may have been simply used as an ink pot. A rare papyrus from Old Kingdom Abusir, two of the famous Amarna letters and part of a king list from Abydos provide written material. Although this is a book based on an exhibition, the variety of artefacts and the quality of the illustrations, combined with the book’s thoughtful text, makes this well worth a place in anyone’s Egyptological library. 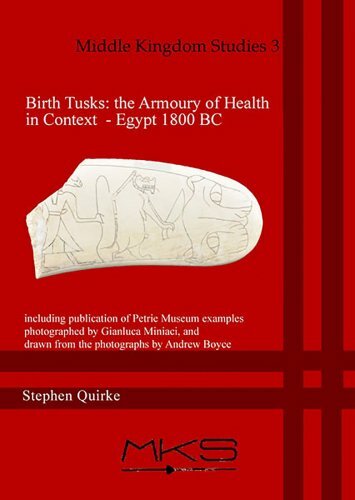 This mammoth tome from the pen of Stephen Quirke, Professor of Egyptian Archaeology at UCL, is an interpretation of an easily-recognisable but misunderstood category of objects from Middle Kingdom Egypt: hippo ivory ‘birth tusks.’ These are conventionally interpreted as magic wands, used to encircle (and thus magically protect) women in childbirth and infants. The book begins with a catalogue of the twenty-odd examples of tusks in the Petrie Museum of Egyptian Archaeology (UCL), with detailed photos and drawings, recording these objects in exemplary fashion. Quirke goes on to survey numerous examples of tusks found within excavated contexts (with fascinating commentary on objects they were found alongside), then those in collections without secure archaeological provenance and finally a very detailed discussion of the iconographical motifs depicted on the tusks. Imagery includes aggressive part-animal demi-gods or demons holding knives, but also benign-looking creatures such as frogs and turtles. Quirke brings together a broad range of references here that illuminate aspects of Middle Kingdom religion as a means of fighting affliction and the uncertain – objects of practical use to people outside the highest elite. There is useful presentation of echoes of the tusks’ imagery much later in Egyptian history: for example, statues of similar entities found in New Kingdom royal tombs and Third Intermediate Period coffins. Because of this, the book serves as a detailed exposition on Egyptian religion through the lens of one particular class of objects – weapons against the unexpected or dangerous. The minute level of examination offered allows questions of craftsmanship and performance to be explored (normally there’s no space for this) and brings the reader into unusually close contact with the makers of these intriguing objects. Mainly illustrated in black and white, this 670-odd page volume is as comprehensive a study of this subject as Egyptology is likely to see for some time. suited to researchers and the (very) interested general reader. This is a collection of papers presented at a European Science Foundation Workshop (2011) devoted to the study of Near Eastern economies in the transitional period between the Late Bronze and Early Iron Ages. It contrasts the economic roles of state and temple, challenging preconceived notions of how the ancient Egyptian and Assyrian economies, domestic and foreign, functioned. The main themes, studied mostly through textual evidence like the Wilbour and Harris Papyri, are the nature of the commodities and services traded between the region’s major powers and the economic mechanisms involved in providing materials and labour to keep states functioning. The editor’s contributions include a discussion of the meaning of ‘money’, the various exchange media and who controlled them. He describes how the palace-based economies, using giftexchange and ‘tribute’ to aid diplomacy and acquire luxury goods, were increasingly replaced by trade conducted on behalf of temples and other non-state institutions. 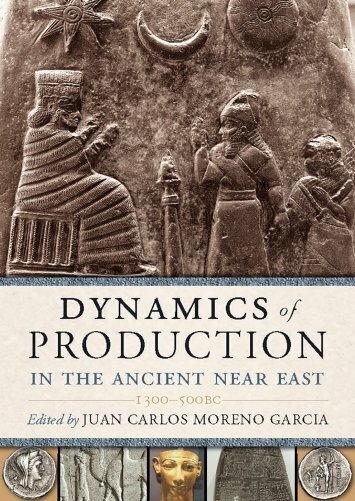 In a fascinating chapter Moreno Garcia discusses the evidence in Egypt for a permanent agricultural labour force, the iHwtiw, from the Eighteenth Dynasty to the end of the Ramesside era, comprising prisoners of war, people sent as tribute etc. who were dispersed to religious foundations and compelled to work allotted tracts of temple land on a quota basis. This workforce was distinct from free tenants who paid rent and from the corvée of conscripted peasants who worked seasonally on state projects as a duty to the Crown. The iHwtiw represented a core permanent workforce but the system declined as the collapse of Egypt’s empire reduced the flow of prisoners and deportees until, by the eighth century BC, iHwtiw had become synonymous with ‘peasants’. Robert Morkot explains how the decline in Nubian gold production by the late Twentieth Dynasty led to a rise in the use of silver as a substitute, for example in the Tanis royal tombs, and as an exchange medium. Since Egypt was no longer in a position to demand tribute, this silver must have been acquired mainly through trade. Salvatore Gaspa’s study of the circulation of silver in Assyria shows how gradually the silver standard of valuation came to be applied to everyday commodities. Renate Müller- Wollermann describes the evolution of coined money in Egypt from the payments of silver made to Greek mercenaries in the mid-seventh century BC to the first coins mentioned in late fifth century texts and the coin hoards of the fourth century. This book is very sparsely illustrated and there are some typographical issues, perhaps due to translation. It is more likely to appeal to academics than amateur enthusiasts but for both it provides much food for thought. 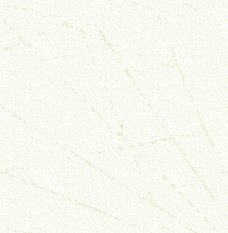 There are several good volumes offering translations of the Book of the Dead, which are in effect compilations of material from a number of different texts. This volume however is unique in presenting a complete translation of one specific book, dating to the Eighteenth Dynasty – the joint reigns of Hatshepsut and Thurston III (c.1479 BC) or possibly earlier. Sobekmose was a ‘Goldworker of Amun’, who probably worked as a jeweller in one of the temple workshops, although we have no other information about him apart from the name of his mother, Sa(t)-Montu. 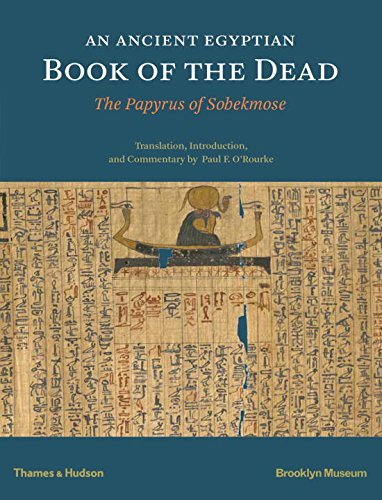 While most books of the dead from this period originated in Thebes, the papyrus of Sobekmose is thought to be from Saqqara and is now part of the Brooklyn Museum’s collection. The scroll itself is inscribed on both sides, written in cursive hieroglyphs and hieratic, and includes ninety-eight different chapters or spells plus four illustrative vignettes. Each chapter is presented in the order in which it appears in the scroll (differing from the accepted standard numbering of chapters, a system based on later period texts) together with interpretation, explanatory commentary and ‘connecting threads’ which show how each chapter relates to those that precede or follow. There are also general explanatory notes about the translation, with technical notes (such as alternative readings) in endnotes. This layout enables the beginner to read and enjoy the poetry of the text while at the same time providing in-depth analysis of each section for the more academically minded. Preceding the translations, there is an informative introduction covering the evolution and development of the Book of the Dead, with a preface detailing the challenges faced by the translation team, a number of colour illustrations and colour plates of the entire scroll at the end of the volume. This is sure to become an academic set text but also offers an absorbing read for anyone with an interest in the ancient Egyptian afterlife. 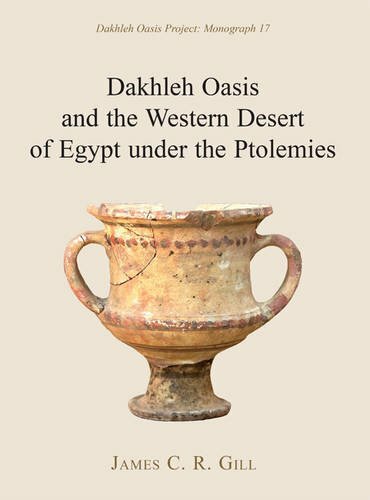 This somewhat heavyweight tome (483 pages) is a modified version of the author’s Doctoral thesis, in which he analysed some of the pottery from sites at Dakhleh collected during surveys of the oasis in the late 1970s and 1980s and later fieldwork. It had always been thought that the arrival of the Romans into Egypt led to a dramatic increase in population and agricultural expansion in the Dakhleh Oasis, and Gill’s thesis attempts to challenge this assumption, suggesting instead that the population was already growing during the Ptolemaic Period. The author makes extensive use of pottery from the site of Mut al- Kharab in the south of the Dakhleh Oasis region, detailing each form found within his discussion and in a series of appendices These discussions, with their drawings of forms and colour photographs, will be a useful guide to the pottery of the region for the serious scholar of the ceramics of the Oasis. But the volume is more than just a catalogue of pottery types. The author also looks at the various locations in Dakhleh and other Oases in the Western Desert in order to assess what Ptolemaic remains, if any, have been found in these sites, and therefore the volume can be a useful guide to some of the settlements, temples and other places that are normally not on the tourist routes. Gill also discusses the so-called ‘Oasis List’ found on the interior of the surrounding wall at Edfu temple, which many visitors to the temple walk past without realising its significance and which depicts the offerings of the pharaoh Ptolemy VIII or IX and his queen, accompanied by fecundity figures which represent various desert oases. The book’s wealth of information about a rarely visited part of Egypt, and from a period of Egyptian history rarely studied, makes this volume a worthy addition to the library of any serious scholar of the end of the pharaonic period. And being a doctoral thesis with twenty pages of bibliographical references, it would provide that same scholar with plenty of avenues to follow for their own further research. As an ordinary citizen of Graeco- Roman Egypt, your house was far more than somewhere to eat and sleep. This fascinating study uses textual and (where possible) archaeological evidence to reconstruct the structure of urban and rural houses of the period (including the aithrion-house with open courtyards, and the oikia dipurgia or multi-storied tower house) and then investigates their role as arenas for different forms of ritual activity associated with both Graeco- Roman and Egyptian cultural traditions. The internal structures of these houses provided domestic space far larger than was required for general living. The house was not only a home but also had important economic, social, religious and funerary functions. Birthday parties, weddings and other ceremonies were held at home while specific areas housed shrines to domestic cult gods. Sacred animals associated with Egyptian gods often lived alongside the human residents, and rituals were performed at the deaths of beloved pet dogs and cats in the same way as ceremonies were held in the home for deceased members of the family both before and after mummification. Lamp-lighting in and around houses commemorated the goddess Athena-Neith but also the search for the body of Osiris. Houses also allowed their residents to express their personal and social identities, allowing the rich (much as today) to declare their social status with imposing frontages, including huge domestic pylons (reminiscent of temple entrances). These pylons were self-contained multi-storied structures with a number of functions, although sadly there are no surviving examples in Egypt. The front door of the house itself, marking the frontier between public and private space, was a key location for social interaction (although women standing in their doorways to chat to neighbours were sometimes harassed by drunken pedestrians! ); the main entrance was also the site of several important rituals, which included the sacrifice of fish and pigs during two specific annual festivals. 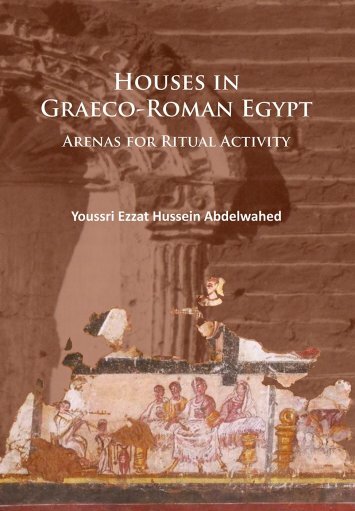 Illustrated with colour and blackand- white photographs and with a comprehensive bibliography, this work highlights the fundamental role of the house as a centre for the critical events in the lives of its residents, and so gives us a better appreciation of daily life in Graeco-Roman Egypt. When fortunate enough to find myself perusing the souks of Egypt, especially those in the famous Khan el-Khalili district in Cairo, I always find myself drawn to handmade objects – tapestries, baskets, artworks, and sculptures. I can easily appreciate the work and the traditions woven into the fabric of handmade objects (both literally and metaphorically). This volume, lavishly illustrated in full colour, is a testament to Egyptian crafts still practised today, which can be traced back hundreds and sometimes thousands of years, spanning the pharaonic, Coptic and Islamic periods. 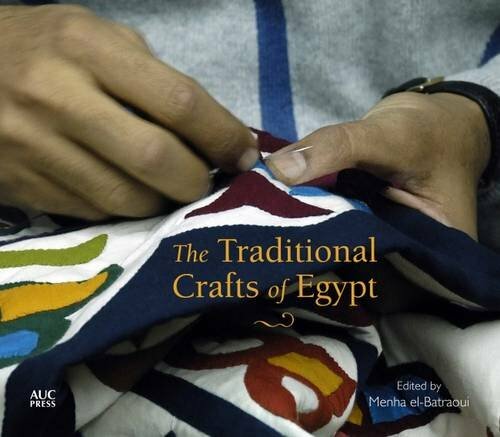 The authors, comprising journalists, archaeologists and novelists, bring together their knowledge and passion for Egyptian handicrafts with the experience of those who still practise these crafts today. The chapters are arranged according to material, including pottery, glass, wood, papyrus and palm – materials that have transcended the centuries – as well as calligraphy, brass and carpets, which tell the story of post-pharaonic traditional crafts. The social impact of craftworking in Egypt is also explored, emphasising the qualities of the artisans who enjoyed “a degree of freedom unimaginable in a modern factory”, and since “there is nothing to prevent conversation or even song during work […]”. Production therefore becomes an integral part of a seamless life rather than something distinct from the ‘real life’ one lives in one’s ‘free time’, making the profession sound somewhat utopian in outlook. While the occupation of craftsworker in Egypt has certainly never been an easy one, the results of their committed and skilful work are clearly evident in this volume. Each chapter thoughtfully unfolds the history of each material, using beautifully captured images of workshops, raw materials and finished objects. I particularly appreciate the value placed by Nermine Khafagi on the production of pottery – a process often dismissed as ‘dirty’ even in ancient times – and it is incredible to see images of hundreds of finished storage jars stacked beside each other in a modern ceramic workshop in Qena, just as the ancient Egyptians would have produced their famous ‘Qena ware’ vessels in this region. The chapter titles themselves emphasise the care and passion with which the authors have eloquently addressed the materials: for example, chapter one is entitled Pottery: From Mud comes Life. As in many post-industrial countries, including the UK, traditional handicrafts have declined at an alarming rate, and the situation in Egypt is no different. However, this volume serves to highlight the skill and passion of those still practising these traditions, often over many generations, which I dearly hope will continue to endure during and beyond the Twenty-first century. Roeten’s thesis is certainly not an easy read. The basic premise of the work is that there is an evident decline in the size of Old Kingdom non-royal mastaba tombs at the sites of Giza, Abu Rawash, Saqqara and Abusir. 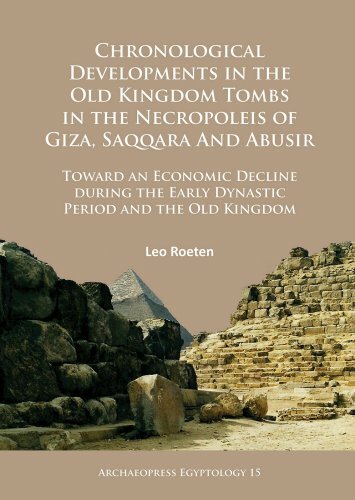 By undertaking statistical analysis of both external tomb dimensions, together with the key dimensions of the internal chapels, the author concludes that this decline in tomb dimensions was associated with a general decline in the economy of pharaonic Egypt during the Old Kingdom which he implies began at the beginning of the period, and not in the late Old Kingdom as previously thought. Inevitably in a book which presents so much data and detail, there will be issues. For example, it’s refreshing to see the author set out the increasing evidence for Early Dynastic development at Giza (a case I have been putting forward since the late 1990s). However, it is not clear why the author has not included the relevant Early Dynastic tombs in his statistical analysis of the Giza necropolis. This omission looks particularly odd given that when assessing Saqqara, the author does include tombs from the Early Dynastic Period. However my main concern lies with some of the methods of statistical analysis used in this assessment. A good example of this is given on page 91, where the author describes how data that has already been statistically assessed to produce Fig 102 of the book is used to provide ‘derivative’ values (Fig 103) which are further processed to produce Fig 104. Such repeated layers of data processing may be totally legitimate (from a statistician’s standpoint) but I can’t help wondering to what extent they provide a disconnect between Roeten’s thesis and the reality of the situation in pharaonic Egypt over four thousand years ago? In summary, this is a difficult book to engage with, more suited to academics. There may be some statistical validity to the methods employed but I do not feel the work explains this in an appropriate level of detail to the general reader. One ancient Egyptian artefact any self-respecting Egyptology collection must have is a shabti; World Museum in Liverpool has 850, and more than 500 of these are presented in full colour in this massive catalogue, the sixth in a series covering shabti collections in the North West of England. 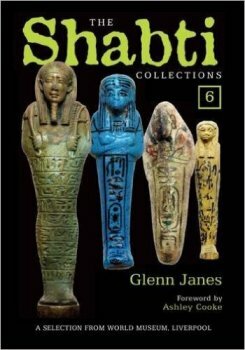 Introductory chapters relate the history of Liverpool’s Egyptology collection (which began in 1861 with a gift from a soap manufacturer who bought artefacts from a Scottish medical missionary working in Egypt) and a brief historical outline of shabtis and their accoutrements, before presenting the catalogue arranged into chronological sections (Middle Kingdom through to Ptolemaic Period) Each shabti is presented in colour from different angles (nearly all are life-sized images) with details of date, material, size, provenance, names and titles, and full description. Inscriptions are reproduced in hieroglyphs, with accompanying transliteration and English translation.There is naturally an extensive bibliography.